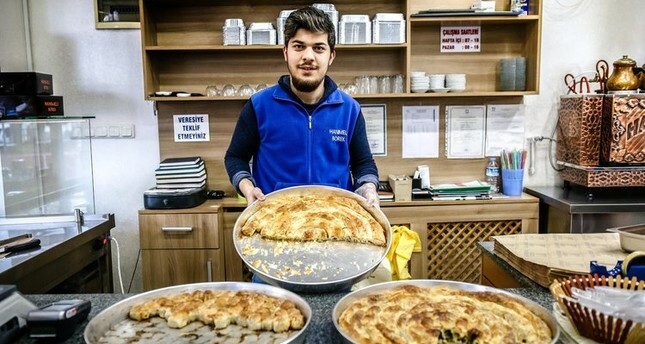 The Hanımeli pastry shop offers spinach, cheese and minced meat burek in the neighborhood. Accordion sounds drift from cafes as neighborhood residents sit by playing chess, you may see more cyclists than pedestrians and maybe hear the phrase "kako si?" as you walk by. Can you guess where I am? This is Sapanbağları, a Bosnian neighborhood in Istanbul's Pendik district. In Sapanbağları you often hear sentences like "dobro jutro" ("good morning") and "kako si?" ("How are you?"). On the streets, young and old alike ride bicycles. Chess is a traditional sport here and you can hear accordion music rise from cafes, mixed with the sounds of classical Turkish music from restaurants. This is another Bosnian neighborhood, along with the Yıldırım neighborhood. As a Bosnian (or rather, as an assimilated one), I have been away from Bosnian customs and traditions for years. I have forgotten many traditions, other than devouring Bosnian manti (dumplings filled with a spiced meat mixture) and Bosnian leek burek (filled, baked pastries made of a thin flaky dough and leek) that our relatives living in the Yıldırım neighborhood cook and send to us during festivals. After my life as a student in the U.S., my love for "standing on my own two feet" moved me to a different place in the metropolis. However, my relatives have always managed to stay together. Even though generations have passed, they have not gone away. They have always moved nearby in the same neighborhood. Thus, Bosnian districts in Istanbul have expanded and flourished. This time, I am taking the road to Sapanbağları, Pendik, to discover my roots and to eat magnificent Bosnian dishes. There are many Bosnian venues on the lists prepared by newspapers and televisions about the best restaurants and the best pastries in Istanbul. In these Bosnian neighborhoods, there are also friendships, smiling faces and plenty of chatter. Sapanbağları consists of four neighborhoods – Yenimahalle, Yeşilbağlar and Bahçelievler – in addition to Sapan Bağları. The majority of the population came here from the Novi Pazar province in Serbia, from 1955 to 1960. They migrated of the fear that war could break out any moment. At that time, they could neither speak Turkish, nor find jobs. They supported each other and settled in the same neighborhood. The Bosnian population in Sapanbağları was once 50,000. When I asked the members of the Bosnia-Sanjak Association about what it is now they said the population must at least 150,000 today. Our first stop is the Bosnia-Sanjak Solidarity and Culture Association. It lies in a multiple-story building. There are rows of bicycles at the door. If it were not for the snowy weather on the day we visited, there would have been more bikes. The Bosnians do not prefer traveling by vehicles. If they have the opportunity, they will prefer to cycle. The lower floor of the building is a hall rented out for weddings and special nights. It consists of two floors and is quite flashy. Previously, the association covered its expenses by means of donations, but it now survives on renting the wedding hall. Not only Bosnians, but anyone who wishes to, can rent this place. The center also has an area in the building where neighborhood residents can come to spend the day. One cannot help but be surprised when you enter the center. Because everybody plays chess there from the first hours of the morning until the association building closes. I asked whether Rummikub, card games or backgammon was available. They said, "There is only chess." At homes, families play chess with their children. Those who want to play backgammon or billiards go to the Hunting Club, which opens in the evening. The association also offers courses such as Bosnian language, rug weaving, embroidery and accordion. Women embroider for the dowry of their daughters and brides at the embroidery course. The most popular restaurant in the neighborhood is undoubtedly Lipa. The Türkoğlu family opened the restaurant in June 1973. İbrahim Türkoğlu, runs the restaurant currently. His nature is kind, but firm. We entered the restaurant at 12 p.m. and heard the song "İşte Benim Zeki Müren" by Zeki Müren playing, one of the prominent figures of Turkish classical music. Only Turkish art music plays at Lipa. There are uniforms and flags of different football clubs in every corner of the restaurant. There are also football fans and supporters present. They wear the uniforms of football teams that they support. Restaurant managers also hang various football jerseys at the facility without any discrimination. Newspaper articles also adorn the walls. The enterprise has been featured on the pages of newspapers several times as "the best authentic Bosnian restaurant." Even though Turkish art music plays in the background, the menu consists of Bosnian dishes. The Bosnian manti and pljeskavica, a grilled dish of spiced meat stuffed with kashkaval cheese, are the main dishes. There are also dishes like dried meat bulgur pilaf, soka (a kind of Bosnian pickle with a cream-like product), dried meat, and Bosnian salad. Among the visitors to the restaurant are many familiar figures from the business world, politics and football. Meanwhile, Lipa also has a breakfast restaurant in Rahmanlar, Kartal, which is run by İbrahim's sons. Like many other famous restaurants, Lipa is located on the Yenipazar Street. The Bilge Super Market, where you can buy Bosnian products is also located at the beginning of this street. Run by the Bilge family, the super market sells food items such as dried meat, ajvar sauce made up of roasted red peppers, Bosnian sausage and special burek flour. Just on the opposite side, there is the Bilgeler cafe operated by the Bilge family. The İrem restaurant, located at the end of the street, is an artisan restaurant serving Bosnian-style homemade meals. The restaurant prepares meals for some 300-500 people on special occasions such as funerals, wedding ceremonies and prayer days. It is possible to taste different dishes at the restaurant which is open seven days a week. Sandzak was the most popular and most elegant restaurant in Sapanbağları. It became so famous that it opened branches in Pendik Marina and Tuzla Marina. So much so that, neighborhood residents name it "the Nusr-Et of Bosnian cuisine," (referring to Nusr-Et, the popular chain of steak houses). Founded in 1974, the restaurant is currently being operated by Adnan Sancak, a third-generation family member. It is a restaurant that combines Balkan cuisine and steak house understanding. The price of a Balkan breakfast consisting of ajvar sauce, soka and roast dough is TL 33. Fried eggs with dried meats are also served for breakfast. But the main thing is the meat. Salad, sausages, dried meat white beans and excellent Bosnian manti are all ambrosia. If you happen to pass, you must certainly stop by and taste the famous dessert, which resembles kalburabastı – riddled egg shaped sweet pastries. The best place for Bosnian burek is Hanımeli. There are a few tables in this small pastry shop. Breakfast starts at 7 a.m., offering spinach, cheese and minced meat burek. They also cook leek and pumpkin-gummy burek if ordered in advance. The price of 1 kilogram of burek varies between TL 27 and TL 33. You can also order a tray of burek for takeaway. My recommendation would be to try the leek burek, which happens to be my favorite also!